Brian Richards, who created the StartBox theme, and now works for WebDev Studios, recently started a new educational initiative for the WordPress community. It’s called WPSessions. 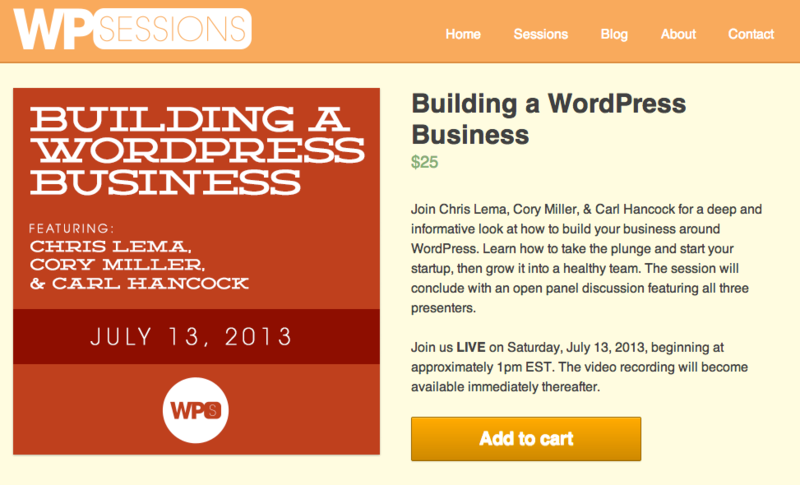 In the upcoming session on July 13th, I’ll be participating in a three-part series on building a WordPress business. In many ways, it’s like a mini-WordCamp that is available to anyone – without the cost of a hotel or airline ticket. For $25, you can hear two experts talk about how they’ve built their WordPress businesses. Given that personal time with either one could be impossible or at least very expensive, $25 seems like a no brainer. I’ll be joining them as well, talking about your staffing strategies and how to make sure you don’t make the mistakes I’ve made. Building a business can feel like an impossible task, and building a successful business can feel even harder. But that’s because you’re looking at the end state, the final results. Instead you want to think about it differently, so that you’re not immobilized. You build a successful business by doing one thing, the main thing, bit by bit, every single day, with tremendous focus and effort. Discipline is something we don’t talk about enough, but it’s critical. I could go on, but today I thought I’d let you hear it from Will Smith. Yes, that Will Smith. Building a business is like that. You start with the small things and you focus on them diligently. Now we can’t, unfortunately, get Will Smith to talk on July 13th. But I think getting Will Smith might have been easier than getting Rocket Genius, Carl Hancock, to join us. I’ve never seen an online interview he’s participated. So I think this is a first. And if you know Gravity Forms, then you know how awesome it is that you have a chance to hear directly from Carl. So go now, and sign up, and trust me, you’ll have a blast!